The Eurekahedge Global Fund of Hedge Funds Database contains information on over 3,000 funds1 based on which we estimate 3,324 funds in the industry, managing assets to the tune of US$646 billion as at end of October 2008. 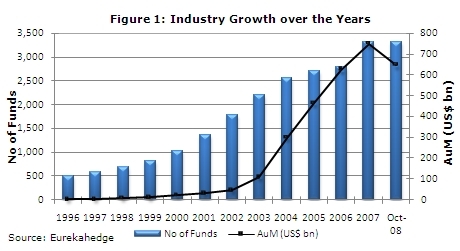 This marks an over three times increase in terms of the number of funds, since end-2000, and a remarkable 26-fold increase in assets over the same period. To summarise, the global fund of hedge funds industry had a rough year in 2008 YTD, after having grown at a robust pace until end-2007. However, despite an over US$100 billion decline in assets, the industry has seen more fund launches than closures during the first ten months of the year. In terms of fund performance, after having lost 16.7% for 2008 YT-October, the Eurekahedge Fund of Funds Index shed another 1.6% 2in November. However, these losses, most of which have been suffered from allocations to long/short equity hedge funds (the Eurekahedge Long/Short Equities Fund of Funds Index -25.5% in 2008 YT-November), completely mask the gains realised by funds allocating to currency- and commodity-investing hedge funds (the Eurekahedge CTA Fund of Funds Index is up 10.5%). Going forward, we believe that manager selection and risk management principles (including due diligence procedures) will play a crucial role in determining the performance of funds of hedge funds. To illustrate, over 40%3 of the hedge funds reporting to Eurekahedge databases continue to remain in positive territory as at end November 2008. A case in point showing the importance of strong and effective due diligence procedures was the US$50 billion Ponzi-scheme fraud by Bernard Madoff, which came to light recently, where a number of funds of funds and investors suffered multi-billion dollar losses. To sum up, it would be interesting to see how funds fare in December, given the fact that both the composite Eurekahedge Hedge Fund and Fund of Funds indices have never seen a negative December, since their inception in January 2000. 1 Including close to 400 obsolete funds. 2 Based on 33% of the funds reporting their November 2008 returns as at 16 December 2008. 3 Based on funds reported as at 15 December 2008, and excluding long-only absolute return funds.